The weekend is on its way folks! We have had many, many days of rain so we are looking forward to a sunny, rain-free Saturday. Time again for simple, sweet cell phone photos from our week. I didn't catch any photos of us sitting out in the pouring rain watching soccer, or leaving swimming lessons early because of thunder and threatening rain. I was too busy trying to stay dry. 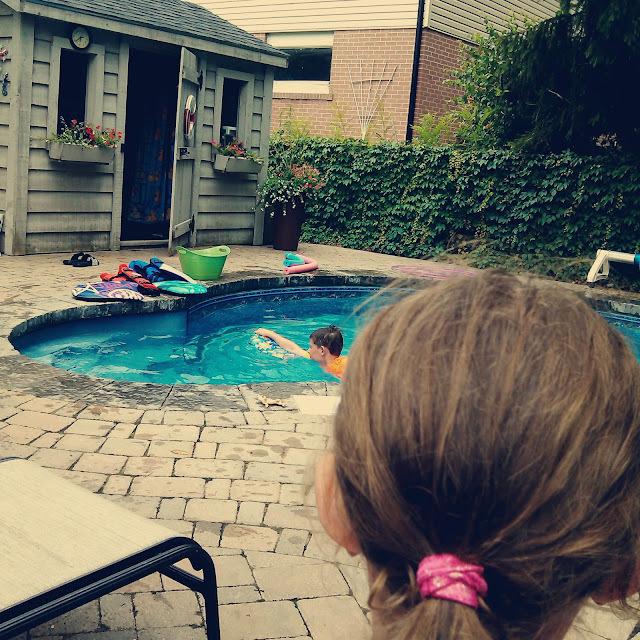 The kids did eventually manage to fit in their outdoor swimming lessons between rainfalls this week fortunately. 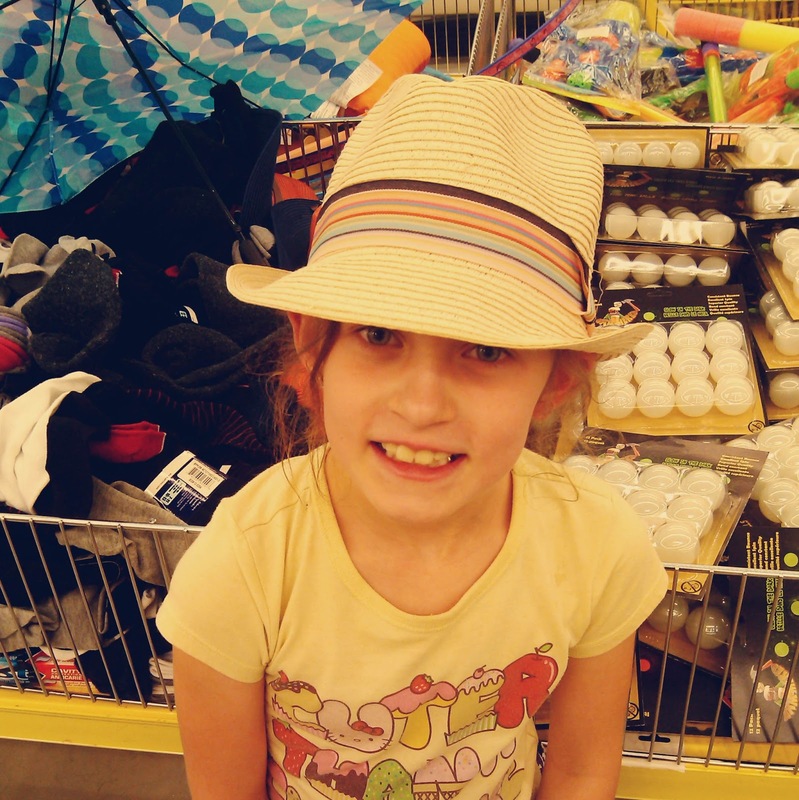 With all of us home for the summer we have been doing everything as a family, including grocery shopping, which I normally do by myself. It means more junk food in the cart. And hats. 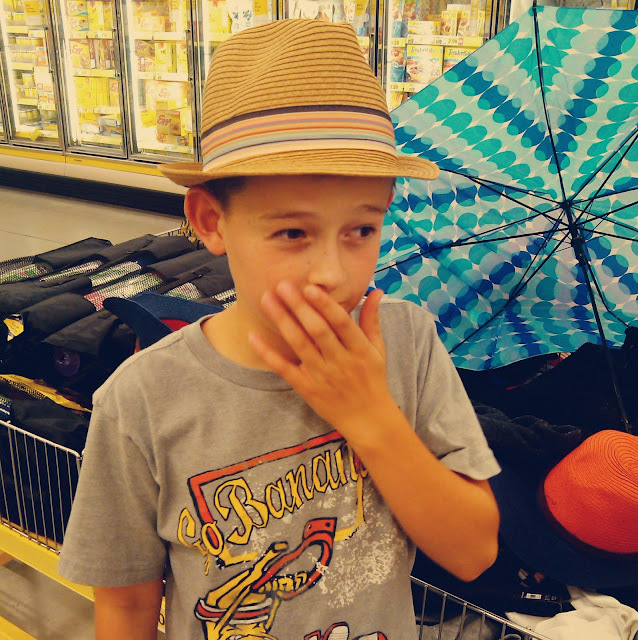 Yes, hats at the grocery store. Not what I would have expected the kids to ask for, but they pretty much ask for everything. My son picked out this hat, above. I don't believe he's going to wear it though. My daughter rejected this one, even though I thought it suited her. 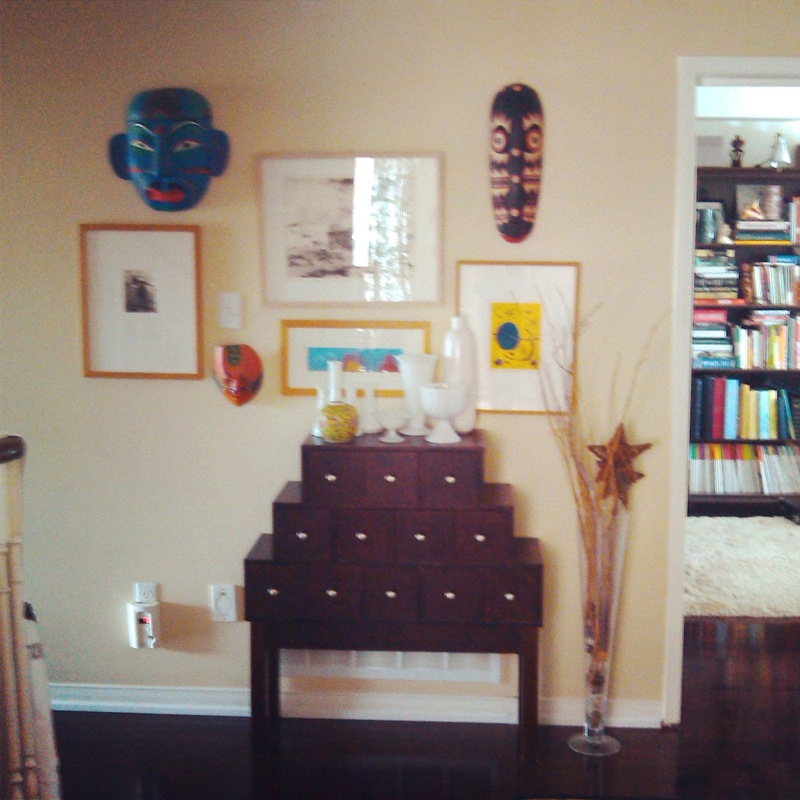 Because we had people over for a party last weekend, our main floor is relatively tidy. Notice I said relatively. Nobody expects perfection around here. Not that it wouldn't be nice. On Wednesday I decided we should focus on the second floor. 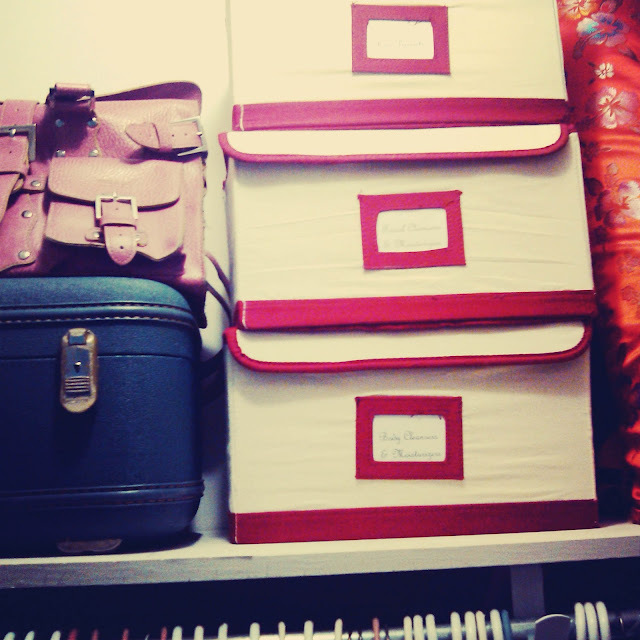 "We" quickly turned into "me," and I decided to focus on my closet. Big mistake. I have this terrible habit of pulling everything out and then getting overwhelmed. Then the project can hang around incomplete for days. Fortunately the closet was pretty much done by Thursday. I just have some random tiny items that I need family members to claim or throw out. Somehow everything ends up in my space. 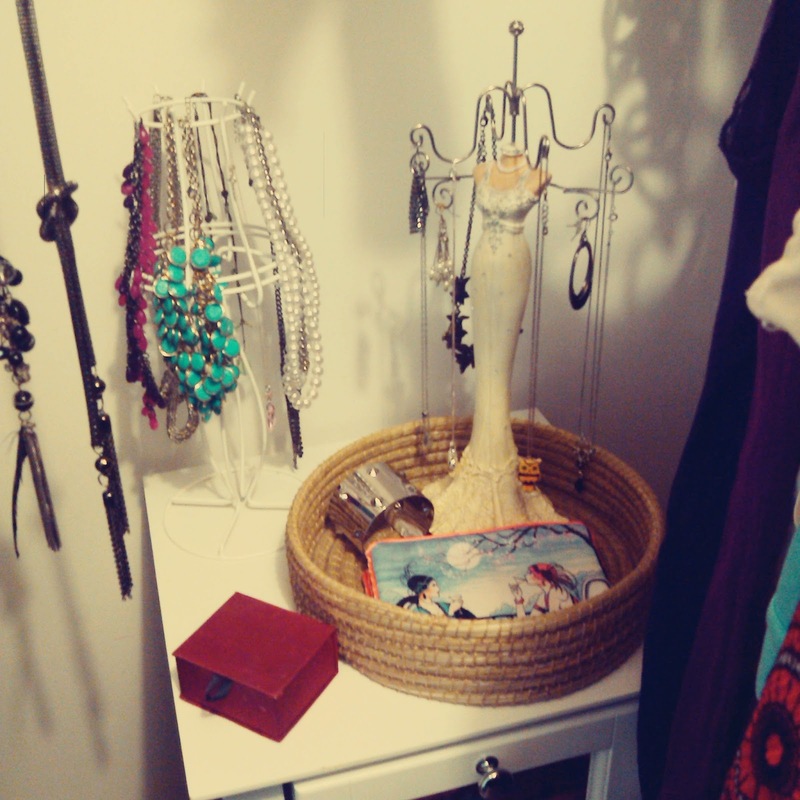 I made a few changes to my closet, like putting my jeans, shorts and scarves in the soft baskets I got at my favourite annual basket sale. I am kind of forgetful, so I tied a scarf around the scarf basket to remind me of the contents. I think I'm going to have to make tags for the others. I tidied up my jewelry area. I like jewelry to be out in the open so I'll remember to wear it. 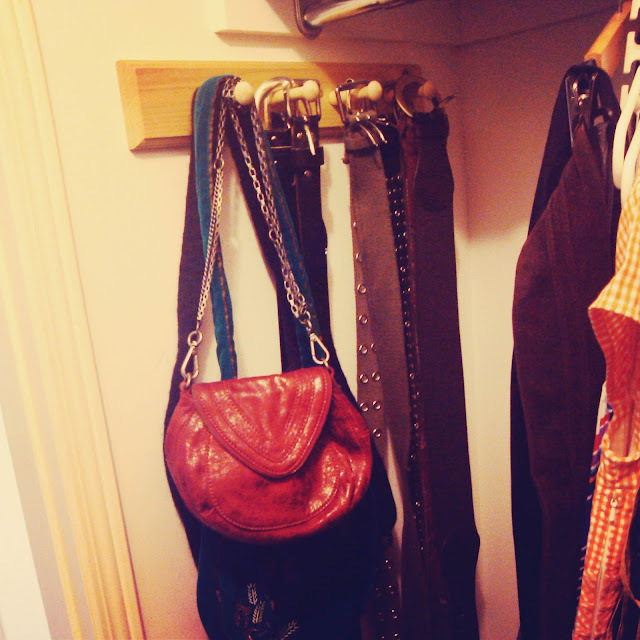 I tidied up purses and belts. I'm sad to say I barely got rid of any clothes even though I haven't worn some of them for years. 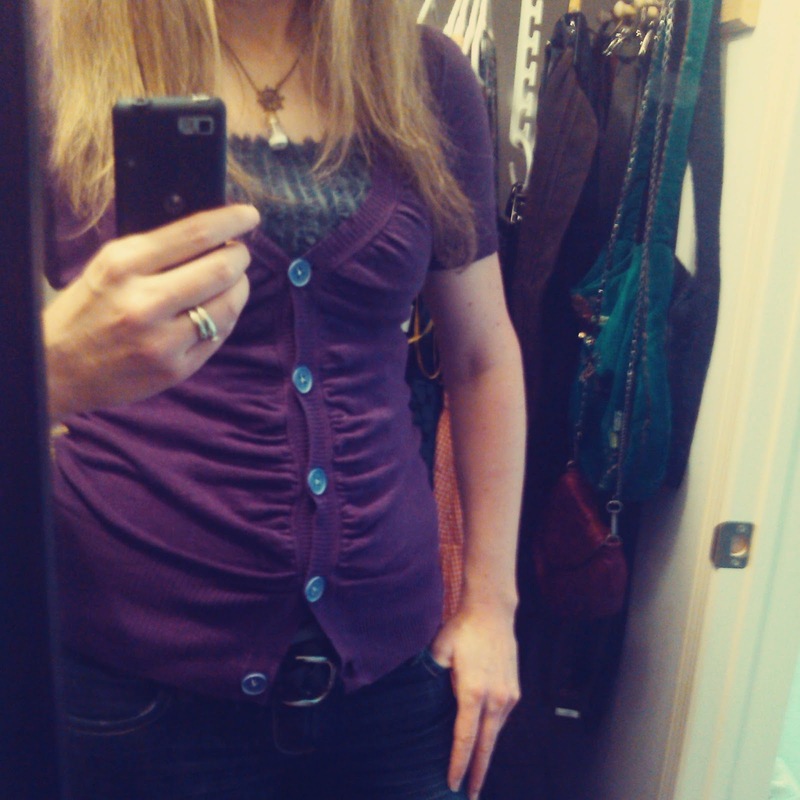 I kept thinking, "I really should wear that blouse," or in this case, that purple sweater. I decided to try to piece together some outfits and wear some different things. If that doesn't work, I'll have to force myself to donate more items. I have boxes that hold my extra toiletries, such as hair products, body wash and facial cleansers. Here is the completed closet. I put dresses front and centre because otherwise I would never think to wear them. To free up closet space, I put all of my sweaters in a trunk at the end of my bed for now. I shudder to think how quickly I might need them again! 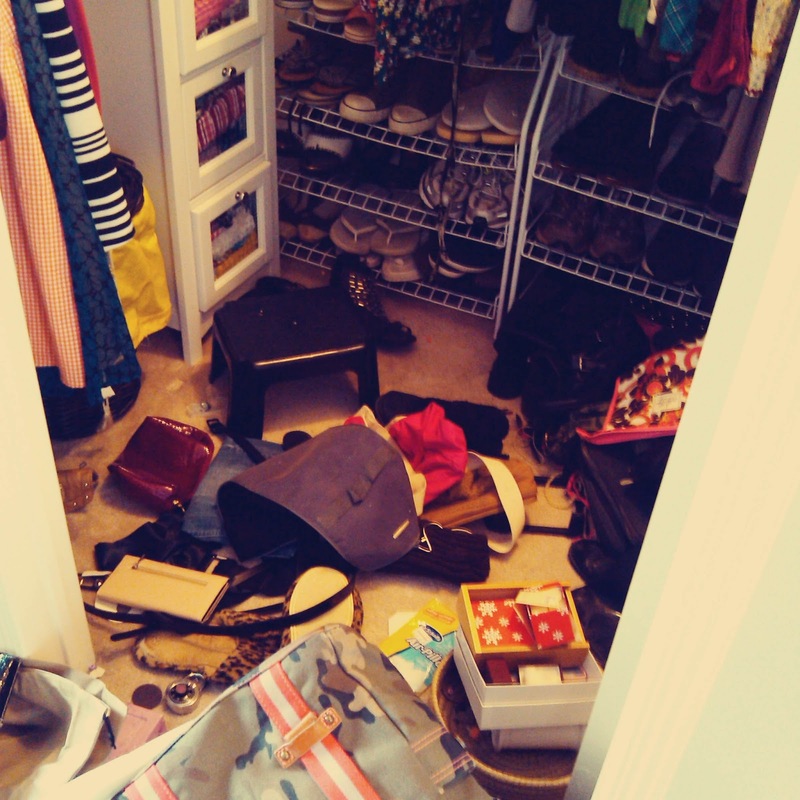 How do you control closet chaos? I believe you, honey, because I'm sure I could fill a dumpster with stuff from this house! We've had gallons of rain too & more scheduled for the weekend. Sigh. Nicely done on the closet fix up! We're all pitiful closet keepers, but I am now inspired to take yet another crack at mine anyway! My closet constantly gets messier and messier until one day I can't take it anymore. The days just seem easier when closets, bathrooms and kitchens are tidy, huh? Great job cleaning out the closet! I really need to draw inspiration from you and do the same. I'm terrible at parting with clothing- I haven't worked in 5 years, and I have bins full of professional clothes in our basement. You must feel proud of yourself - closet cleaning is no fun!!! Gosh, don't we all have trouble areas! At least I hope we all do. Because we have more than a few around here. Stopping by from liferearranged. I love the layout of your blog, it's so cute! And it definitely looks like you've had a fun week! Thanks for visiting and for the nice compliments. I hope you have a wonderful week! Looks great! I just went through my closet (well, most of it-I ignored all the shoes). It's so tiny that I constantly have to go through and thin things out. It's kind of sad, Ruby actually has a bigger closet than my hubby and I do! Wow... you did an awesome job on your closet! Way to go! Wishing you a lovely, sunny, weekend! Thanks so much Jennifer! I got the lovely, sunny weekend you wished for me. :) I hope you have a wonderful week. My heart started racing when I read the word "photos." That's an organization project that terrifies me. One, my old prints are not organized and Two, I have hardly printed any digital photos for YEARS! I'm one of those people who has to have a photo album in perfect order, so I just don't do them! Scary. Yes, I am thankful that I don't have to share the closet with my husband. That is a blessing. Unbelievable, Joann! 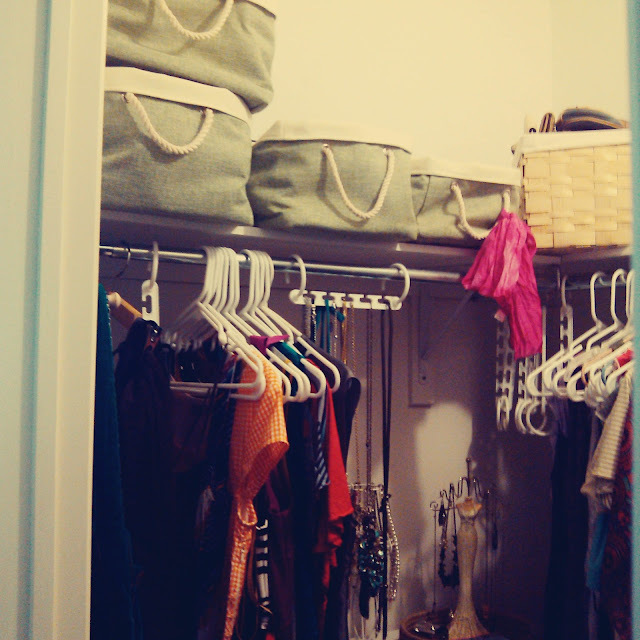 You did such an amazing job with your closet! One day I plan to color coordinate my closet....or organize by item...blouses, pants, vests, etc. until I decide which it will stay in the present disarray. Love your ambition!